Harbour in the Northland Region of North Island. Here the harbour collects the waters of two rivers, the Mangamuka which branches inland to the northeast and the Waihou that comes in from the east past Mangungu, Horeke and Rangiahua. Kohukohu was one of the first European settlements in New Zealand. The first recorded European to enter the Hokianga Harbour arrived in 1819 and by the 1830s, Kohukohu was the heart of New Zealand's kauri industry. The country's first Catholic mass was celebrated 8 kilometres north of Kohukohu at Totara Point in 1838. 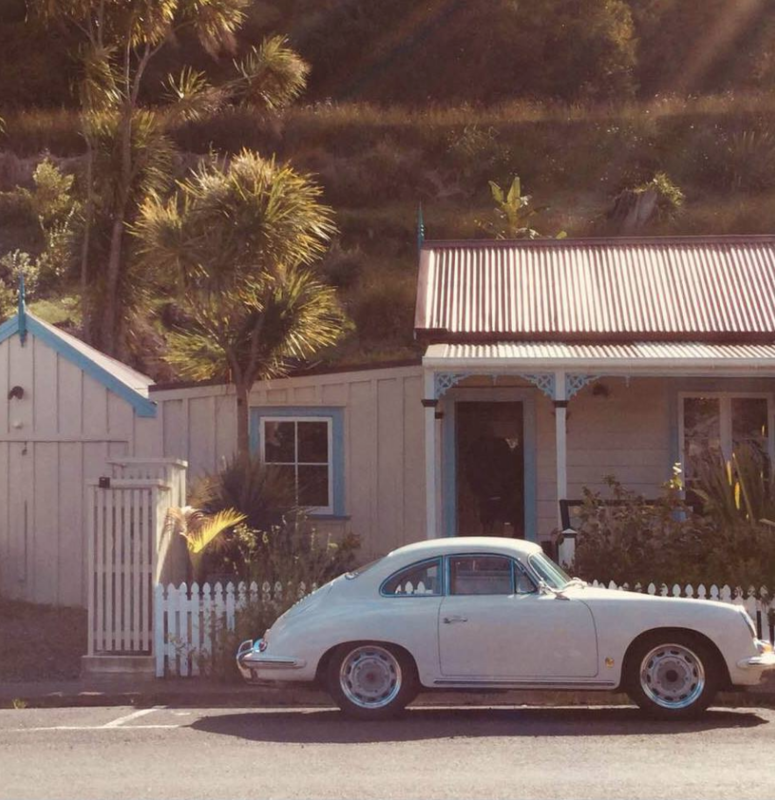 Today, Kohukohu is home to an eclectic mix of people - musicians, artists, writers and craftspeople who enjoy meeting folk from all over. You can enjoy fishing off the wharf, a walk on the beach at Mitimiti, browsing the historic films and pictures at Kohukohu library or viewing the art on display at the local galleries. The charm, beauty and gentle pace of Kohukohu with it’s historic houses and rambling gardens will work its magic on you. 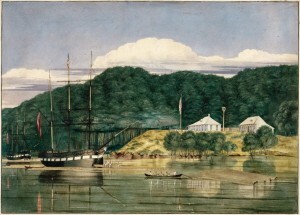 This painting is by Charles Heaphy and shows G. F. Russell's house and timber yard at Kohukohu, Hokianga Harbour, with a ship and a barque, the Francis Spaight (nearer vessel) and the Bolina (on the left) loading kauri spars; and a row-boat hauling spars. According to Te Tai Tokerau tradition, the legendary Polynesian explorer, Kupe visited the area in 925 AD prior to his return voyage to Hawaiiki. Angry at the food from the hangi (earth oven) being insufficiently cooked, he cursed those responsible using the word kohu. Hence Kohukohu.